Mushroom Risotto is a family favorite. We love the creamy texture of this dish. It warms our bellies on those cold days while living at the beach. Normally we would be eating this more in the winter months but this year, it's cold. The beach is cold, windy, and most days, misty. Last year we had beautiful weather and this year is different. To escape the cold we have been leaving the area and camping in Bend, Oregon. We love Bend. We were there two weeks ago and it was 95 degrees. AHHHHHH...that felt so good. So good, in fact, we just scheduled another week. 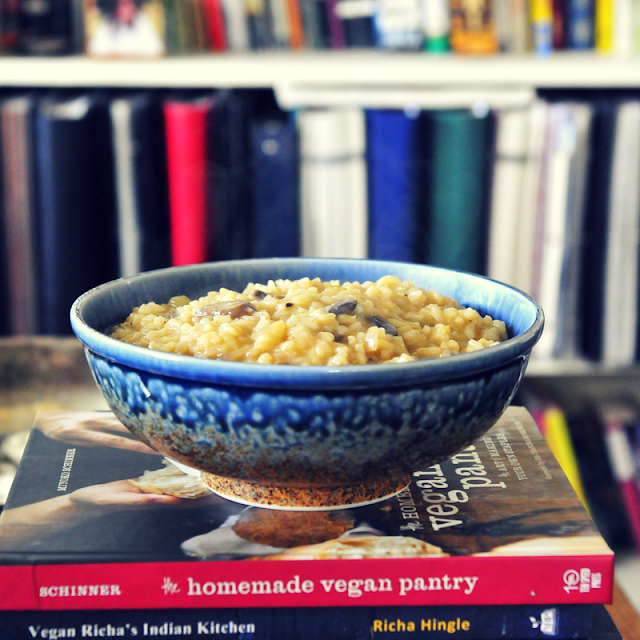 Making risotto is not as quick as throwing rice in the rice cooker. It takes some time. Just clear your schedule for about 25 minutes and devote the time to bringing this creamy and filling dish to your family's table. 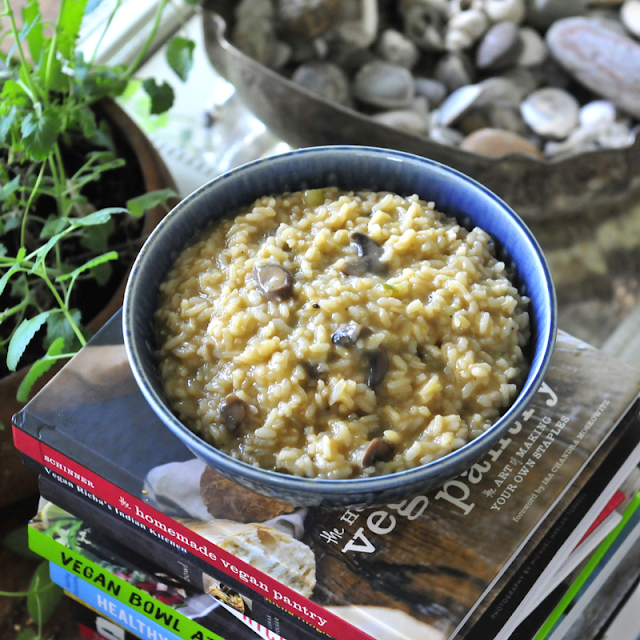 The key to making risotto is adding enough liquid to ensure the rice is not crunchy. I personally do not like the rice to have a bite to it. I want mine to be a smooth bite. This is a vegan recipe. I have chosen to use a vegetable stock, no cheese, and fresh vegetables from our local Farmer's Market. I will say that I used Miyoko's European Style Butter to saute the vegetables and it added a depth of flavor to this dish. **This is not an ad. All of the products I mention are simply because I use them in my kitchen and they are what works best in our menu planning. Next time I will be making the risotto with corn. MMMM...now I want Corn Risotto. I use the Braggs Amino Acids at the very end to add a robust flavor. I hate to say the word "meaty" but that is what it does in my opinion. We use a lot of vegetable stock and sometimes it is nice to have a different flavor and this provides that. This dish with the mushrooms and black pepper pairs nicely with the "meaty" flavor of the amino acids. 1. In a heavy dutch oven (I use Le Creuset), heat vegan butter. Add the zucchini and onion. Saute until clear, about 3-4 minutes. Add the garlic and saute for 1 minute more. 2. Add rice and lightly brown rice. Warm the broth/stock in a separate pan and have near by with a ladle. Prepare to stay at the stove until this dish is done. 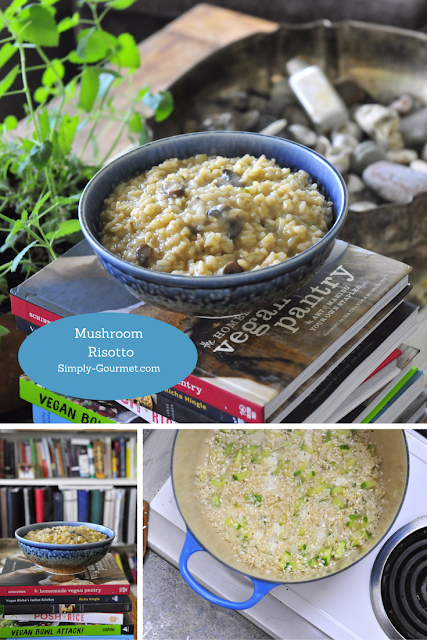 The risotto will stick if you do not stir constantly. 3. Ladle one scoop at a time to the rice mixture. Stir until absorbed and then repeat. Stir, add broth, stir, add broth, repeat. Do this until the rice is creamy and soft. HINT: My rice tripled in size when it was close to being finished. 4. Add the amino acids and mushrooms. Continue adding broth until risotto is complete. 5. Serve immediately or store in a covered container in the refrigerator. Warm to serve left overs.